William Lyndsay Lewis signed for Irvine Meadow in season 1951-52. It wasn’t a particularly successful spell for the club, but Billy played at inside left as Meadow beat Neilston in the final of the Irvine & District Cup in his first season. The following year he was in his real position of centre half in the team that won the Vernon Trophy, beating local rivals Irvine Victoria in the two-legged final with an aggregate score of 5-1. In 1953 he went senior with Morton in what was then the Second Division, playing 115 matches for the Greenock club and scoring 9 goals, before transferring to Third Lanark on 18th August 1956. Although Third Lanark are long gone, they were still a force in Billy’s day and he helped them to promotion in his first season then to a third place finish in the old First Division, as well as an appearance in the League Cup final, playing at right back. Hearts were too strong in that final, however, fighting back from a goal down to win 2-1. In total he played 227 times for Third Lanark, scoring 6 goals. During his time with the Hi-Hi Billy toured Canada and the USA, playing a series of friendlies over a period of four weeks. Most of the games were against local teams, but three were against Birmingham City. In the first game against City, Thirds won 4-1 with Billy scoring the fourth goal when “a quite fantastic Lewis solo effort ended with an unsaveable 30-yard drive.” The second “friendly” was less pleasant for Billy as he was virtually attacked by the Ukrainian Nations’ centre-forward, who was sent off, sparking a pitch invasion by the fans. Towards the end of his time with Third Lanark Billy won a winner’s medal in the 1963 Glasgow Cup final, when Celtic were beaten 2-1 at Hampden. But Billy had two connections with Meadow: not only was he a dominating centre half in spite of being only 5 feet 9 inches, but he was also the father of Robert “Rab” Lewis who wore the Meadow number 7 shirt. Rab, of course, was a member of the squad that famously won the Scottish Junior Cup in 1973 after three dramatic matches against Cambuslang Rangers. Still on the subject of nicknames, Douglas Gorman adds, “Billy’s nickname at Thirds was apparently ‘Flu’ I am told ‘this originated from the terse, single word telegram he sent to Cathkin once explaining why he couldn`t play on Saturday.’"
This was in Meadow programme from February 2016 against Petershill, sadly Bobby passed away just a couple of months after this interview. Gordon said that both Bobby and Ann Carroll were great hosts to him for the interview for the Meadow programme. Legend is a word often used too much but Bobby Carroll certainly was one for Meadow being such a huge influence in our first Scottish Junior Cup win. In 1959, Irvine Meadow famously flew to England to play a friendly against Birmingham City. The Medda players gave a good account of themselves, losing 4-3, with Birmingham getting the winner from a last minute penalty. Bobby Carroll, who went on that season to score well over 70 goals and win a Scottish Junior Cup winners’ medal with Meadow, played in his usual position at outside right in that game. GMcC: How did you and the rest of the team feel about flying down to the friendly match against Birmingham City? Bobby Carroll: Most of us weren’t too happy. None of the players had flown before, so that was their first flight. So, it was quite an adventure. GMcC: Obviously most of the players would have a day job. Did you have difficulty in getting time off work to make the trip? Bobby Carroll: No, I didn’t. I don’t know about any of the other boys, but my boss was good. At that time I was working on the railways. GMcC: Birmingham City fielded a largely reserve team of full time professionals… did you notice a big difference in fitness levels between them and yourselves? Bobby Carroll: I really don’t remember that much difference. We got beaten but didn’t get beaten by much. GMcC: That was obviously a fit Meadow team. Were the team and officials entertained by Birmingham City before or after the match? Bobby Carroll: No, there wasn’t anything like that. We just arrived, played the game and were away again. GMcC - The timing of the match coincided with an outbreak of polio in the UK and there were some concerns about the team travelling. Then a few days after the game a Birmingham City player who didn’t play in the match, Jeff Hall, was diagnosed with polio and died on 4th April 1959. Did you know anything about that at the time? GMcC: You were voted “Empire News” Junior Player of the Year that season, 1958/59, what do you remember of the award ceremony? Bobby Carroll: It was in the cinema in Irvine and it was on the Friday night before the Scottish Cup final. At the interval the provost (George Donaldson) came up on stage with me and presented the trophy. Funnily enough, the “Empire News” went bust not long after. On the Wednesday before that I had my 21st birthday, so it was a big week for me. GMcC: Of that 1958/59 team which played in Birmingham and later won the Scottish Cup, Les Dickie and Jackie Morrison both played for Junior Scotland. As player of the year and a prolific goal scorer I am surprised that you did not win a Junior cap. Were you injured? Bobby Carroll: No. I don’t know who the guy was, but there was somebody in the S.J.F.A. wanted his player in rather than me and that was the situation. That’s what I was told. I’d never get in as an outside right, because the position was somebody else’s. G McC: How did you come to sign for Meadow in 1969? Bobby Murray: I was playing with Queen’s Park, but at that time I was also a policeman in the Irvine area. I got to know that Irvine Meadow were interested in signing me, if I was ever leaving Queen’s Park. So, I got approached by Bob Alexander and I decided then to sign for Irvine Meadow. My brother had played for them prior to that as an outside right. John Murray, my brother who has just recently passed away, was a great player in his own right and told me they were a good club and I signed for the Medda. G McC: Did you notice a big difference between playing senior for Queen’s Park and playing junior? Bobby Murray: I found that you had more space in the senior game. The junior game was tighter and harder. That was the real difference. I felt there was more a great team spirit with the Meadow than I had at Queen’s Park. G McC: You’d find a difference between playing at Hampden and playing at Meadow Park. Bobby Murray: Yes, I remember my first game at Hampden and you could hear every voice in the crowd and not just hear then, you could actually see them. Hampden was great to play in, but when you got a really big crowd at Meadow Park and you were playing important games the atmosphere was brilliant. G McC: How would you describe yourself as a player? Bobby Murray: An inside forward with a good eye for passing the ball and I also had a good method of finding space. I always tried to make sure I was in open space so that I could receive the ball, which gave you time to look for the pass. G McC: And you carried a goal threat as well? Bobby Murray: Yes, I was able to put a few balls in the back of the net for Meadow and was only too happy to do so. My dad used to complain that I didn’t shoot enough. He said I passed it too often and should have had a go myself, but that’s just the type of player I was. G McC: One of your goals brought the West of Scotland Cup to Meadow Park? Bobby Murray: Yes, I remember the game. It was at Petershill’s park against Cambuslang. We had a very good side and we won four trophies that year. I remember picking the ball up just inside their half and going by one defender and then realised there was a big gap opening up. Dave Malone was away, as he usually does, going to the far post and he took the defence with him and rather than pass it this time to him, which I had done previously for the first goal, I shot. It was a long-range shot and beat the goalkeeper. G McC: Then, in 1972-73, you went down to the Metropolitan Police in London, which meant you missed out on the season when Meadow won the Scottish Cup by beating Cambuslang in the final. Was there a sense of frustration at that? Bobby Murray: Not so much frustration as regret. I would have loved to have won the Scottish Cup. The year we won the four trophies I thought we had a good enough side to win it. We had beaten Cambuslang in the final of the West and they won the Scottish that year. But I was fortunate enough to go up on the team bus to see the games and the Meadow had a really cracking side that year and deserved to win. G McC: At that time there was an intense rivalry between Meadow and Cambuslang. How did you find games against them? Bobby Murray: The crowds were always big and the atmosphere was brilliant, so any time you were playing a team of that standard both teams seemed to raise their game and it was a better spectacle for the crowd. G McC: After your year with the Met in London you came back for another four seasons at Meadow Park, but the team wasn’t able to keep winning trophies. Bobby Murray: The team had changed quite a bit. The turn around of players was quite high at that particular time and therefore the cohesion was lost and we certainly didn’t play anywhere near the standard of the previous years when I was there. G McC: Who were the Meadow players that stood out for you in your two spells with the club? Bobby Murray: I’ve got to say Jim Clunie, who was the centre half and captain for the first two years I was there. He was a brilliant centre half. The ball seemed attracted to him in the air and though he was a big fellow he could play football as well. He stuck out. My fellow midfielder Willie McArthur on the left side was a tenacious player and a very good footballer and I enjoyed playing with him. Beside Jim Clunie was Charlie McCrorie, who went on to become the captain and lift the Scottish Cup. He was a very committed centre half, read the game well and marshalled his troops very well. Johnny signed for Meadow from Port Glasgow in 1948, just a few months after the club’s Scottish Cup final defeat against Bo’ness United. It was a successful start, as he was a member of the team which won the North section of the league and played at inside left when Meadow beat Annbank United 5-1 in the Western League Championship decider. Nevertheless the season was a success with Johnny in the Meadow elevens which won the West of Scotland Cup, the Irvine & District Cup and the Western League, beating Craigmark 3-0 in a replayed decider. In appreciation of their efforts the entire team, including Johnny of course, were made Freemen of the Royal Burgh. At the end of the season Johnny left Meadow for the first, but by no means the last, time when he signed senior for Raith Rovers. In 1955-56 he was back in Meadow blue and performing so successfully that he was capped for junior Scotland against Ireland and Wales. He was also chosen to play against Eire but had to withdraw because of injury. That season he picked up another winners medal in the West of Scotland Cup, playing at outside right, with his brother Ally at inside right, as Meadow beat Clydebank 4-1. In 1956, he left Meadow again, this time in the direction of Kirkintilloch Rob Roy, causing him to miss the 1959 Scottish Cup final success against Shettleston. But he signed for the cup holders for a third time in 1959 and started a spell at the club, which would eventually see him raise the Scottish Cup at Hampden bedecked in blue and white ribbons. It’s fair to say that Johnny is best known for his performances in season 1962-63, when he captained the club to its second Scottish Junior Cup success. Stonehaven, Blantyre Victoria, Fauldhouse, Camelon, Dalkeith and Bellshill were all swept aside as Meadow powered their way to the semi-final at Rugby Park. A Willie Garvie hattrick beat Craigmark and attentions turned to the final at Hampden Park. And what did he say about the teeth? “The teeth were so loose I just pulled them out and threw them away.” (Scottish Sunday Express) That evening on the balcony of the Townhouse when showing off the cup, he even tried to talk clearly into the microphone to a jubilant crowd, who could barely understand, but cheered in appreciation anyway. The following season Meadow reached the semi final again, with Johnny described in the programme notes as “a five-star full back,” but Cambuslang Rangers were too strong and ran out 2-0 winners. Johnny left Meadow yet again, this time moving just across the river to Irvine Victoria. He later joined Kilwinning Rangers where he played at inside left and scored as Buffs beat Ardeer Thistle 10-3 in Stevenson. Eventually he drew the curtain on his playing career, but that didn’t stop him re-joining Meadow yet again. This time as coach. One thing is for sure: Johnny McIntyre was a winner. Willie “Beef” Niven joined Irvine Meadow in time to play his part in their Scottish Cup run of 1947-48. With Niven playing at left half, Bathgate Thistle were beaten after three games in the semi final and Beef’s team mates were indebted to him when he cleared a scoring shot off the goal line in the first of two 0-0 draws. Diminutive right-winger Tommy Hannah scored the only goal for Meadow in the 2nd replay and Bo’ness United awaited Meadow in the final. Before the big day at Hampden, Beef was selected to represent Scotland. A newspaper of the time reported; “Irvine people were delighted when they learned that Willie Niven, Irvine Meadow, had been chosen in the Scottish Junior football team to play against Wales. He has been playing in great form this season and thoroughly deserves the honour which has come his way. It is not often that a player gets an international cap in his first season as a junior.” On 1st May 1948, Scotland, with Niven making his debut, won 5-3 in Bangor, but there was no happy end to the season at Hampden as Bo’ness won the Cup final by 2-1. Beef went on to play seven times for his country, a Meadow record which still stands, and captained the team in his final four appearances. His record of three wins, three draws and only one defeat speaks for itself. In fact, he was awarded an eighth cap when he was selected as a travelling reserve against Wales at Easter Road in 1953 when, although the Evening Times said of Beef, “There is not a better left half in the country,” the position went to a young Dave McKay of Newtongrange Star. Mackay, who passed away on 2nd March 2015, went on to have a highly influential career with Hearts, Spurs and Derby County and played in 22 full Scotland internationals. Season 1950-51 proved to be the finest in the club’s history. They won the West of Scotland Cup, the Western League Cup, the Irvine and District Cup and the Western League Championship, with Beef Niven playing in all the finals. The team also set off on another Scottish Cup run all the way to the final. The junior record crowd at Hampden saw Petershill win 1-0 with their winning goal coming near the end. Beef almost blocked the 10-yard scoring shot from Peasy’s James White, but only managed to deflect the ball into the Meadow net. Although their was no cup to show off, fans and the people of Irvine turned out in large numbers to welcome the team home from Hampden and on the 31st May there was a civic reception when Beef and the other players, were made Freemen of the Royal Burgh. Over the next few years, Beef continued to add to his medal haul, winning cups and leagues with Meadow, but the elusive Scottish Cup stayed just out of reach. In 1957-58, Medda reached the semi final stage only to lose to Shotts Bon Accord thanks to a last minute own goal by left back Gray. Davy McDougall only played one season for Irvine Meadow XI before setting off on a remarkable footballing journey, which took him all round the United Kingdom. He signed up in 1898 and played at outside left when Meadow beat Newmilns 4-0 in the Ayrshire Cup final at Rugby Park. It was the first trophy Meadow had won as a junior club and Davy scored the first of their four goals. “Jamieson sent in a fast cross shot, which the goalkeeper saved, but McDougall met the ball rebounding off him and scored the first and only goal of this half.” (Kilmarnock Standard). After one season at Meadow Park, McDougall turned senior with Rangers, but was not able to break into the first team. He moved on loan to Partick Thistle, where his arrival was seen as a “real capture” by the publication Sport. Davy started his Jags career with silverware when he was in the team that won the Partick Thistle Sports Day 5-a-sides tournament, beating Linthouse and Clyde. More importantly, he won the Second Division championship with them in 1899-1900, making 39 league appearances and contributing 14 goals. At the end of the season McDougall was recalled to Rangers, for whom he played 4 league games, scoring 3 goals, as Rangers became Scottish champions in 1900-01. He also played in 11 friendly matches (another 4 goals) that season, but his impressive goals per game ratio didn’t secure him a regular start and during the season he moved on loan to Bristol City, who at that time played in the Southern League in England. After 11 games and 4 goals with the Bristol club, he had a short spell with the small Perthshire club, Vale of Atholl FC. The Pitlochry club had reached the Perthshire Cup final and Davy was one of the “big name” players they signed to strengthen the team before facing St Johnstone in February, 1902. Still a Rangers player, he next moved to Ireland to play for Distillery, making a scoring debut on 31st May 1902. His 14 goals in 1902-03 were vital in the club’s three trophy wins, the League, the Irish Cup and the County Antrim Shield, and he helped win the League again in his last season there, 1904-05. He later played with distinction for another Belfast club, Glentoran, and at the start of the next decade became the first ever full time player-manager of Cardiff City. He began signing players, a number of whom he knew from Scotland and the North East of England and built an experienced team. His signing policy was rather expensive but he was aware that he needed a team that could compete with the opposition. McDougall, who also captained the team, took Cardiff to a respectable 4th position in the 12 team league but only stayed in his player-manager post there for one season. However, the foundations he put in place set the club up for their first Welsh Cup victory the following year. manager, to lead them in their fist season. The other players talked him into becoming club captain as well and it was in that capacity that he lead Newport County onto the field for their first competitive match, a Southern League 2nd Division against Mid-Rhondda from Tonypandy. McDougall lost the toss in front of 5,000 fans, but then lead his side to a 3-0 win, with Davy scoring the second goal from the penalty spot. It was his only goal in 22 league appearances as he steered Newport County to a safe 10th place. He stayed only that one season with County and when he left he ran the Excelsior Social Club in Cardiff then went on to manage a few more pubs in the Cardiff area and still attended Newport games until the mid 1930's. Winning the Scottish Junior Cup catapults all the team members to the status of club legends, but some, like Arthur Paterson, go a step further by scoring the goals that bring the cup home. The former Aberdeen player’s moment of glory came in 1963, when Meadow beat Ayrshire rivals Glenafton Athletic 2-1 at Hampden Park. Paterson, playing in his usual position at outside left, scored Meadow’s equalising goal in the 37th minute in front of 21,000 fans. The following season, he was in the Meadow team which reached the Scottish Junior Cup semi final, before losing to 2-0 to Cambuslang Rangers at Firhill Park in Glasgow. And his form was so impressive that Ayr United signed him up. Duncan Carmichael describes his signing for Ayr in his book 100 Greats - Ayr United Football Club; “On the Friday evening of 8 May 1964, 1,569 people turned up at Somerset Park to witness Craigmark Burntonians defeat Irvine Meadow 4-3 in the Western League Cup final. Two players on view were on the brink of signing for Ayr United. Arthur Paterson, then aged twenty-four, was one of them.” The other player was Craigmark’s Alex McAnespie, who went on to have a spell as manager of Irvine Meadow after his playing days were over. Paterson signed for Ayr and scored 5 goals in his first league campaign, surpassing that with 12 in 35 matches the following season when Ayr won the Second Division. According to Carmichael, “Paterson’s flamboyant wing play made him popular with the fans. His close control, electrifying bursts and long-range drives were all facets of his play.” As well as all that, he had the knack of hitting dangerously inswinging corners. After a struggle in the First Division (in the days when it was still the highest league in Scotland) where Paterson’s natural attacking play was stifled, he moved on to Clydebank. In his three seasons with Ayr United he had started 72 matches and scored a total of 27 goals in all competitions. Although I was one of the 21,000 fans at Hampden in 1963, I only have one real memory of Arthur Paterson. It was from a match at Meadow Park and Paterson was out on his left touchline in front of the stand. A square pass from midfield was going just behind him and the linesman whipped his flag up anticipating a throw in just as Paterson threw up his right heel and pulled the ball down perfectly. My grandfather, Peter McNidder, who often took me with him to home matches, shouted, “You’re too quick, linesman!” The linesman wasn’t the first to be caught out by Paterson’s quick feet and speed of thought. Tommy “Tots” Fullarton was one of Meadow’s greatest players and a Scottish Junior internationalist, but there was one particular thing that always eluded him - a Scottish Cup Winner’s medal. After starring in Ayr schools football and representing Scotland schoolboys three times, Tommy Fullarton began his junior career at Muirkirk, where he played until the outbreak of war in 1939 saw him loaned to Kilmarnock Juniors. It wasn’t long before he was called up for army service, where his footballing skills were recognised and he represented the Eighth Army at inside forward with none other than England’s Tom Finney partnering him on the wing. After the war he returned to Kilmarnock Juniors and promptly found himself up against Irvine Meadow in 3-3 draw. Fullarton opened the scoring in the 17th minute and also got his side’s third goal, as reported in the now defunct Kilmarnock Herald, “ …after that, Fullarton who had been forcing the game hereabouts – worked his way towards goal and when ready to score was pulled down. The ball ran clear and Gillespie smashed it into the net, but the referee awarded a penalty. Fullarton scored to make the score 3-3.” Tommy followed this up with another good showing at Meadow Park, when the home team won 3-1, and Meadow officials were so impressed with his performances that they immediately entered into transfer negotiations and signed a player who so nearly lead them to Scottish Cup glory. His first game for Meadow was in the 5th round of the Scottish Cup in a twice- postponed 6-2 success in Fife against Lochgelly Albert. Then in the quarter-final Meadow were at home to Blantyre Celtic, winning 2-0 in front of a then record crowd of 8,000. At the semi final stage Meadow fell to Shawfield Juniors at Ibrox, losing two goals in the last ten minutes in a 2-3 defeat. It was the first of three Scottish semi finals for a Fullerton inspired Meadow XI. At this point, though, Meadow almost lost Fullarton. He was all set to fly out to Mexico to join up with a small Scottish contingent at a club called Asturias who played in Mexico City, but two days before his departure a telegram arrived cancelling the trip, owing to the club disbanding. It was a lucky break for Meadow. The following year, 1948, Meadow reached the semi final again after setting another attendance record at Meadow Park when 10,180 witnessed a 1-0 win in a 6th round replay against Lesmahagow. The semi against Bathgate Thistle went to three games, all at Ibrox, before Meadow eventually reached the final with a 1-0 win. The match report of the first replay, a 0-0 draw, had stated that the “only player on that field who had the sense to run into the open space was clear-domed Fullarton, the Meadow inside left. Some of the other forwards could have done with that great advantage to the game.” Despite the compliment about his play, he may have been less than thrilled about the reference to his lack of hair. The following season Meadow faced Bo’ness again, this time in the 5th round and set yet another attendance record for Meadow Park, with 11,547 cheering Meadow to a 2-0 win. Reporter George Manson, writing in a national newspaper, had this to say, “Tommy Fullarton, the hero and match winner was just back from his honeymoon. Tommy played the game of his life, and besides helping M’kay to score the first goal skelped on a beauty himself 15 minutes from time to make victory certain. I can’t understand why the senior clubs are not queuing up for Fullarton’s services.” But the next round was the end of the road for Meadow’s cup dreams, even though they set another ground record, 13,470 at Meadow Park, in losing to Stonehouse Violet. Tommy’s third semi final came in 1951, when Meadow drew 2-2 at Ibrox with Broxburn Athletic, then won the replay 2-0 at the same venue. The final against Petershill was Tommy’s last shot at cup glory, but it wasn’t to be and Meadow went down by the only goal of the game. Injury curtailed his last season at Meadow and he was allowed to move on to Dalry Thistle, where he played for two seasons, then Craigmark Burntonians. During his time at Meadow the only medals Tommy had not won were in the Ayrshire Cup and the Scottish junior Cup, but it wasn’t for the lack of trying. Thanks to Gordon McCreath & Douglas Gorman for the information. In 2007 a defender who had started his football career with Irvine Meadow at the tail end of the 1930’s was voted Motherwell FC’s “Greatest Ever Player”. Most people who know a wee bit about Meadow’s history and great players of the past would guess it was Willie Kilmarnock. They would be wrong! It was the following season when Paton really made his breakthrough into the team. After a Scottish Cup first round 0-0 draw with Largs Thistle he was drafted into the line-up, again at inside right, for the replay. Not only did Meadow win 3-1, but Paton was amongst the scorers, “… from a corner kick Paton cutely flashed the ball past Brown for the equaliser.” (Irvine and Fullarton Times). Paton’s place in the line-up was now secure and he played in most matches until the end of the season. He even had the chance to end his time at Meadow with a medal as they reached the Western League Cup final in what would be Paton’s last game in a Meadow jersey. But it all went badly wrong as Ardeer Recreation romped to a 5-1 win. He left Meadow Park at the end of that season and turned out for Kello Rovers. From there he signed for Motherwell and made over 500 appearances at centre half in the famous claret and amber jersey. In his early days at Motherwell, his manager, George Stevenson, gave him a few games in his old inside right position and was quoted as saying, "I am hoping too that Andy's experience in attack will deter him now from taking these occasional ambles up among the forwards. We like him most when he is well back." In 1951 he had the honour of leading ‘Well to their first ever trophy success in the League Cup Final, winning 3-1 against Hibs, when he took over the captaincy from former Meadow man Willie Kilmarnock, who missed out due to injury. The following season he partnered Willie Kilmarnock at the back as ‘Well won the Scottish Cup, defeating Dundee 4-0. He was also the first recipient of the Motherwell Supporters’ Association Player of the Year award when it was introduced in 1956. Andy Paton made three international appearances for Scotland. His debut came at Hampden in January 1946 in a 2-2 draw against Belgium. The game was originally classed as an “unofficial” Victory International, but was later re-classified as “official.” Then, after a six-year pause, he turned out again in a Scotland shirt in two official international matches against Denmark (winning 2-1) and Sweden (losing 3-1) during a tour of Scandinavia in May 1952. At 5’10” he was no towering centre half and didn’t play in the typical style of the day. Rather than launch the ball as far up the park as possible, Andy would have his manager and fans tearing their hair out as he dribbled the ball out of defence and looked for a pass to set up an attack. After his time at Motherwell, he turned out in Hamilton Academical’s colours for one season then managed them for the following nine years, taking them to a League Cup semi final in 1960-61. When he retired from football, he qualified as a sports masseur and ran a sports injuries, chiropody and chiropractor clinic in Irvine with his wife until moving to Fife to be closer to their daughter and their grandchildren. Andy Paton passed away in February, 2014 at the age of 91. His son-in-law summed him up as a defender, “He was nicknamed ‘Smiler,’ though he hardly ever smiled, and he could be fierce. He always got his man” (Motherwell Times). Some goalkeepers seem to attract controversy. Our own Michael Wardrope in his time with Medda was prone to picking up the occasional red or yellow card, for example. “Scenes of disorder prevailed at Barrfield’s Park, Largs, on Saturday at the conclusion of the football match between Largs Thistle and Irvine Meadow. And incident between Wright, the goalkeeper of Irvine Meadow, and a spectator led to a general uproar. Alexander “Sanny” Wright, who was fined the sum of 3 pounds (or 30 days’ imprisonment) for the Largs incident!! He had joined Meadow in season 1928/29, winning the Western Intermediate League, the Western Intermediate League Cup and the Moore Trophy in his first season. Meadow also reached the Scottish Intermediate Cup semi-final that season, but lost 0:1 to Ashfield at Dalry. Meadow joined the Scottish Junior F.A. for season 1931-32 and went on to win the West of Scotland Cup and the Ayrshire Cup in Wright’s last season before turning senior with Charlton Athletic. In a demonstration of Sanny’s popularity at Charlton, even the stewards and turnstile operators sent wreaths along with the official ones from the club directors. His club also donated £20 to Torbay Hospital and paid not only the funeral expenses, but also the rail fares for his family when they had rushed south to be with him. During the following season according to James F. Delury’s History of Irvine Meadow XI F.C., “ …a deputation from Meadow XI gathered at the graveside of “Sanny” Wright in Kilmrnock New Cemetery, to pay a tribute of respect to his memory.” A memorial tablet with the inscription “a token of respect from Irvine Meadow XI F.C.” was placed on the grave and team captain Ian Meek laid a wreath. In Duncan Carmichael’s book Ayr United F.C. : 100 Greats, Eric Morris is described as “the ultimate utility man.” And no wonder, for during his senior career with Rangers and Ayr United he turned out in every outfield position and even played once in goal for the Glasgow side, albeit in a six-a-side tournament. Irvine Meadow fans, however, will forever associate him with the number 11 jersey and wax lyrical about Morris flying down the left wing and scoring vital goals as Meadow won the Scottish Cup in 1973. Eric Morris played only one season with Irvine Meadow, but his impact was enormous. He signed from Troon, having previously played with Muirkirk Juniors, and made the left wing position his own. By the end of that season, 1972-73, he had left opposing defences in ruins, been named Scottish Junior Footballer of the year, had a Scottish Cup winners’ medal and a contract with Rangers. In the first game of the epic final against Cambuslang Rangers at Hampden, Meadow went ahead after only five minutes when Morris picked out Mike Gillespie with a cross and Alan Johnstone despatched his knock down into the net. After Cambuslang had equalised, Morris got the ball wide on the left in the 29th minute, raced forward, cut inside and lashed a low shot into the far corner. The game eventually finished 2-2 and a replay was required, which drew another stunning performance from Morris. Early in the second half, with Meadow trailing by the only goal, Johnstone flicked on a Hugh O’Brien throw in and Morris hooked the ball into the net. Two minutes later the Meadow winger scored again from close in, but Cambuslang scored again to take the game into extra time and then went ahead, leaving O’Brien to head a last gasp equaliser. Morris finished off his short Meadow career with a flourish as he scored one of the goals in a 3-1 success against Jeanfield Swifts as Meadow won the National Drybrough Cup, after having beaten great rivals Cambuslang 4-2 in the semi-final. In his six year spell at Ibrox, Eric Morris made only a handful of first team appearances, scoring his only goal against Queen’s Park in the Scottish Cup in 1974. He then joined Ayr United as a striker, scoring over thirty goals in his first three seasons, before moving back through various positions to play as sweeper and being voted the Supporters’ Association Player of the Year in 1982-83. Played for the Scottish League v League of Ireland on 17th March 1980 in Dublin. The side was managed by Jock Stein bur lost 2:1. The next day they played the Irish League in Belfast and won 4:2. I only have a record of Eric playing in the first game but he might have been on the bench for the second game as it was probably a minimum size squad. The game in Belfast was the first for a Scottish representative team for ten years. On behalf of hugh o'brien. leg victim, Jimmy McQuade, in hospital following the game. What a player! What a character! Different class!! " "Very sad news, one of the best ever to wear the Meadow shirt. I can still see him scoring that penalty at Hampden. " "What a character was Hugh, still remember him destroying the Meadow as Vale won a Scottish Cup tie 4-2 at Millburn in March1972. He was then transferred to Meadow in the summer and the rest is history. Condolences from all at Vale of Leven." "Re Hugh O'Brien, surely one of our best players ever and boy could we do with a player of his class and undoubted Medda loyalty today R.I.P Hugh all condolences to family & friends "
"A true legend - he stood out in a Team of great players in 1973. " " I remember the final well, first game we had a minibus from Springside Bowling Club, The first replay we all piled into my works van. 2nd replay the van was in for a service had to go and ask my uncle in Crosshouse for a loan of his car which he gave me on condition I let his doos out over the Eaglesham moor. It was all worth it to see the magnificent Hugh O Brien. " 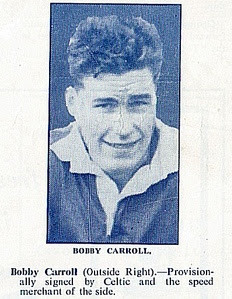 Railwayman Bobby Carroll was a Scottish Junior Cup winner when he joined Glasgow Celtic FC (provisionally signed on 22 Sep 1957) from Irvine Meadow XI FC. The week Bobby turned 21 (on the Wednesday), he collected the Junior Player of the Year trophy on the Friday and won the Scottish Junior Cup on the Saturday. This prompted his call-up to Celtic where he went straight into the first team. A prolific scorer at junior level Carroll made his first team Celtic debut on August 12th 1959 in a 2-1 League Cup defeat at home to his boyhood heros Partick Thistle. A whole hearted player Carroll made Celtic history when he scored the Hoops first ever goal in European competition when he netted at Valencia in the Fairs Cities Cup on September 26th 1962. Bobby went on to score 27 goals in 78 appearances at Celtic before moving to St Mirren in 1963, then Dundee United, Coleraine and Queen of the South. Now retired (in 2005) and happily settled in Calderwood with wife Ann, Bobby enjoys weekly jaunts to Celtic Park where he taught his son Paul, 43 - who once played midfield for the ‘Medda’ - all about the beautiful game. "One of my memories was of a Scottish cup quarter finals match played at Meadow Park, as one of the younger players and goal scorer I was marked by the burly left back the whole game, we were losing 2-1 with only a minute to go when we scored the equaliser so on the return match just before going on the park Bob Alexander told Hugh Strain, Tommy Wark and myself to swap jersey's, poor Hugh got kicked up and down the park because he had the number 7 on and I was allowed to run riot and we won the match 5-1. ( If my memory serves me right. I think I scored a hat trick )."